It’s official! 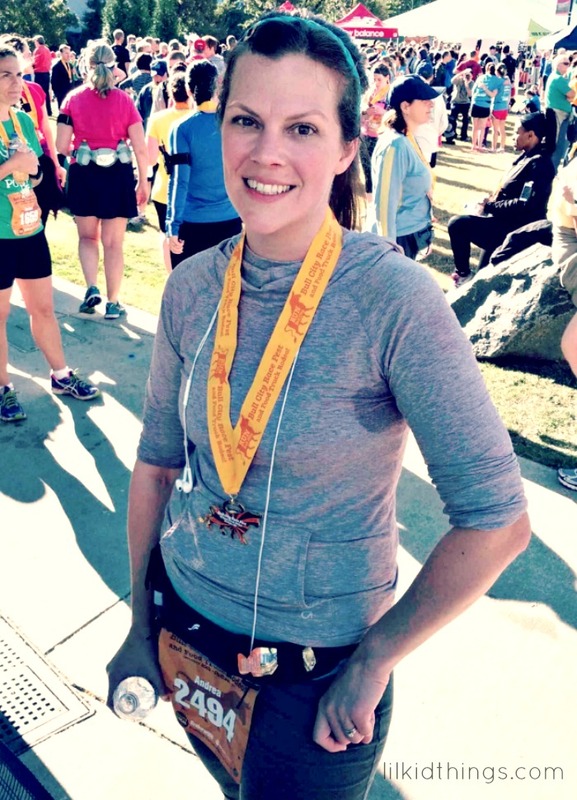 I am a bona fide half-marathoner with a medal and everything! I even have the sore legs to prove it just in case you need a back up. Let’s just say living in a split-level home is not my favorite today. But the aches and pains are worth it because I ran a half marathon, baby! Yeah! If you follow me anywhere other than this blog, you saw a lot about my day already and probably cheered me on. THANK YOU! I loved reading your messages and seeing the likes and favorites and little notes of encouragement. I was amazed at all of the support I had yesterday! It really made me remember my community and how much we love to see each other succeed. I am truly blessed. I don’t know where to start, honestly. It was such a cold and amazing and scary and exhausting day. 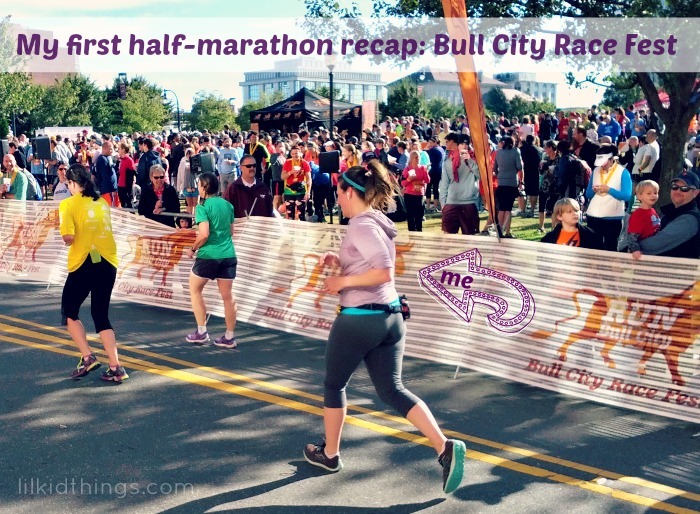 The Bull City Race Fest was beautifully organized. This was the first year for the half marathon length but to my understanding they have done other distances in the past. The shirts are great, the communication was excellent, the festivities were really fun and the course was well staffed and marked. All of that said, I was pretty surprised by the hills. I think partially due to my own inexperience, but from what I am told by other more seasoned runners, this was a very challenging race. I chose the race because I needed a qualifier for the 2014 Princess Half Marathon that I am running as part of the Glass Slipper Challenge in Walt Disney World next February. You must submit an official time to be placed into a corral with other runners around your same speed. If you don’t submit a time, you are placed at the very end and I knew I didn’t want that. I chose this race because of the dates and the fact that it was in Durham which is only about 3o minutes away. It wasn’t until after I had registered and they released the course map that I saw people mentioning the hills as a possible issue. I looked at the elevation map and it looked intimidating, but I’ll be honest, I didn’t really know how to read it and just figured it would be fine. Race day is here and I have trained well with a few gaps for travel and general busy-ness. I was a little worried but I also knew that I would just get out there and do it, come what may. 5am: My alarm went off. I hit snooze. 5:15am: I am up and getting dressed in the clothes I had laid out the night before. 5:35am: I am pulling out of the driveway and on my way to Durham! Parking was quite busy when I got there but once I got into the parking deck, I found a spot with no issue. 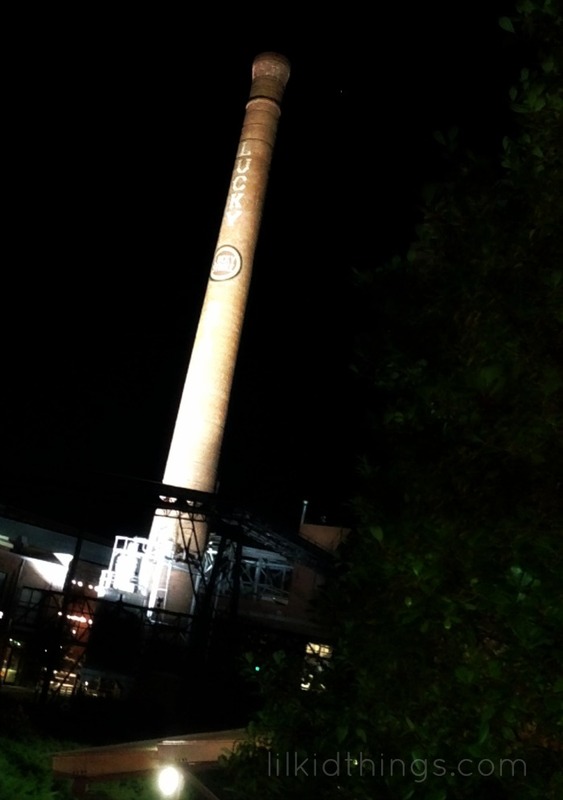 I walked through the beautiful American Tobacco campus to get my bib and t-shirt. I forgot about the shirt so I walked back to my car to drop it off. It was really cold though so I wanted to keep moving! I was back at the starting line by 7am and still had about 30 minutes to spare. I walked around taking pictures, trying to keep warm and used the bathroom twice. I guess I was nervous after all! 7:20am: I am shoulder to shoulder with somewhere in the neighborhood of 5000 runners ready to go! We listened to the national anthem and counted down to the gun. 7:30am: The race officially starts! I cross the start line about 5 minutes later and I’m off! The first 2 miles seemed quite honestly like nothing to me. My music was going, I was enjoying myself and before I knew it, we had a water stop! I was doing a pretty good job pacing myself despite the excitement. I don’t remember seeing the sign for mile 3 so I was a little worried that my internal clock was off. It wasn’t long after that I saw the mile 4 marker. Yay! I knew there would be another water stop at mile 5 so I just kept on moving with a short walk break here and there. Mile 5 was also the end of the line for those doing the 5-mile distance. Here, the course split into two and it was a little confusing at first so I walked a bit. I decided to go ahead and eat my GU chews since I was walking anyway. 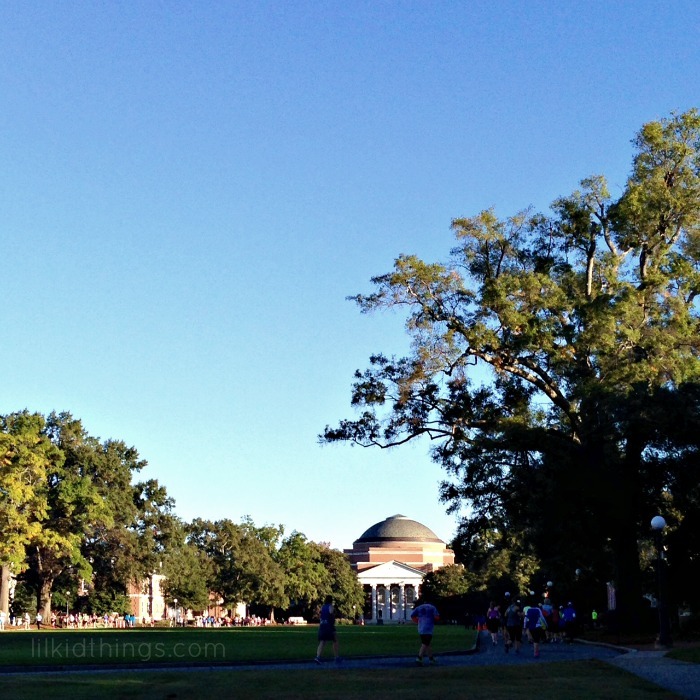 We ran through the quad at Duke which was really fun and I grabbed some water. Miles 6-8 were pretty decent and steady. And then the hills started. My thighs couldn’t sustain the uphill climb so I lost time walking then. My knees were screaming on the downhills. I thought for sure that the last mile would be a nice glide into the finish, but I’ll be honest. It was brutal! When I finally turned the corner to see the finish line it seemed like miles away. Mentally, I was starting to shut down. I started to panic and wonder if I could/would make it. Of course I would. Right? I walked for a bit and that was impossible. By now walking was too painful and too slow for me to imagine. I started what I think was jogging but at this point, it could have been hopping with a little leg drag thrown in for good measure. I was almost there! I heard my name and looked over to see my husband and the boys cheering me on. A smile! I did it!! I crossed the finish line and kind of went starry eyed for a bit. Somehow I had a medal in my hand but I honestly don’t remember getting it. I drank loads of water and let it all sink in. My official time was 2:41, which is about a 12:18 minute mile. It’s a little slower than I had hoped for, but overall I am completely thrilled with the day. I just ran my first half-marathon. And that’s the thing about running. You can’t cheat. You are using your own legs to move your own body weight. You can’t lean back onto a seat or forward onto your arms. Even with all the encouragement, at the end of the day it’s all ME and only ME. There are only a few times in my life when I have been this proud of myself. Congratulations Andrea! Just the thought of hills that far into a race makes me ache for you, but you did it and you SHOULD be proud! I’m running a 10K qualifier soon and I can’t wait to (hopefully) see you at the start of the Princess Half in February! Yay Cathy! I am so glad I will (hopefully) see you there! Congratulations! I’m so happy for you — the training, the follow through, the achievement. You did great. You did great. My son lives there an I know those hills. Good job, love reading your blog. Thank you! I know I shouldn’t complain because hey, I finished right? Great job with your running too! I do a walk/run combo and that took so much pressure off. That’s SO fabulous, Andrea! So very happy for you.